In order for CompuFoil to be able to perform automatically updates, I made a change that would make windows ask to allow CompuFoil to have administrator access when it is started. Without administrative access, when you save your new files with CompuFoil, although you think they are being saved withi the normal 'Coords' folder, they really aren't. In Vista and Windows7/8/8.1/10, Microsoft handles the Program Files folder different than it did under WindowsXP and 2000. Applications are no longer allowed to save data within the Program Files path, (for 64 bit systems, it wound be Program Files (x86)). Microsoft realized that this change would break a lot of programs, so they made the operating system have the ability to fool the program into thinking that it put data into the program files path, but in reality, redirects it to a whole different location. CompuFoil defaults to saving and loading your airfoils out of the C:\program files\CompuFoil3d\Coords folder. However, what you were saving is going to a Microsoft "Virtual Store" folder. Have you seen the movie "The Aviator"? The R/C aircraft wings used in this movie were developed using CompuFoil! CompuFoil is the most recognized name in airfoil template software. Easily produce foam template, built up wings, leading edge shaping guides, and planforms. You simply specify the basic geometry of the wing, as well as any spars, holes, building tabs, etc., and CompuFoil does the rest. Powerful airfoil editing capability allows the user to customize any airfoil. The new 3D rendering module gives the user unprecedented control over the design, allowing for quick layout checks before picking up the X-Acto blade. Supports Windows XP/Vista/7/8/ and 10. Upgrade discounts are available for previous version users. CompuFoil is used by thousands of hobbyists world wide, as well as respected universities, government agencies, and model manufacturers. ScopeKnob is the first ever application specifically designed to generate and print calibrated elevation knob tapes and sidewheel focus tapes for airgun use. Included as well is a ballistics module. By reverse calculating the ballistics factors, it will allow you to generate your finished tape, with super accuracy, with only 15 or less trial shots. Your tapes are stored in a database for easy retrieval/modification. Everything on your competition air rifle shows your pride of ownership, do you really want a hand drawn elevation tape? Let ScopeKnob print out a professional looking tape that you design. 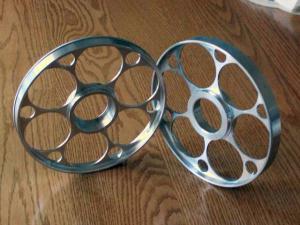 Sidewheels: These are machined from a solid piece of 6061 aircraft grade aluminum. They are very light, and very tough. Current designs fit both the Nikko Sterling and BSA Diamond scopes. Adapter hubs are available for several other scopes. Contact me for adapter hub availability. Elevation Knobs: These are machined from a solid piece of 6061 aircraft grade aluminum. The normal height is 1" x 2.3" diameter. Custom sizes available. Stock sizes fit both older black knob and newer green knob Niko and BSA Diamond scopes.